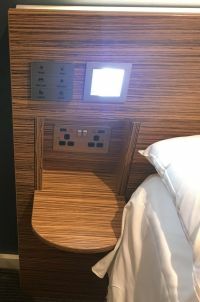 Rooms feature the company’s signature luxurious king-size Travelodge Dreamer bed which sits within a mood-lighting surround and has three-pin and USB charging points on both sides. Also featured are LED ceiling lighting, providing a warm ambiance, a "comfort cooling" system, 32in freeview TV, wi-fi and free in-room tea and coffee making facilities. BTN stayed at the Waterloo Travelodge for AOA (see this issue). The large SuperRoom offered a Lavazza capsule coffee machine, Hansgröhe Raindance shower, a choice of firm or soft hypoallergenic pillows, hairdryer, iron and ironing board. At just £8.95, the unlimited breakfast was very good value, the bar and social area open 24hr. Grumbles? Yes – 30min of wi-fi should be unlimited, a "soft" closing for the WC is needed, and in the shower the shabby plastic curtain should be replaced by glass.